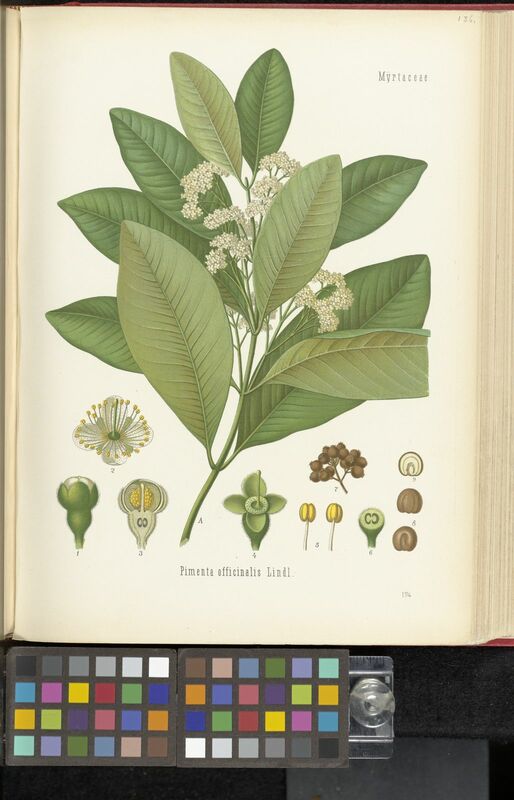 Allspice is derived from the dried, unripe fruits of Pimenta dioica. 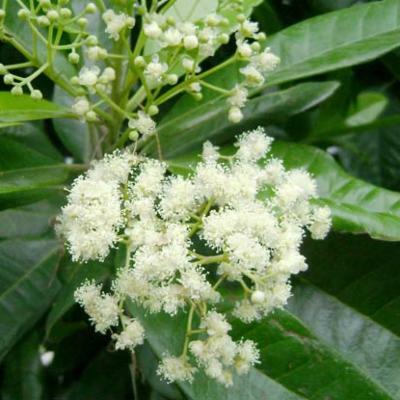 It is mainly cultivated in, and exported from, Jamaica. It is also known as pimenta or pimento. Tree to 20 m with young branchlets glandular and pubescent. Leaves aromatic, oblong-elliptic, elliptic or elliptic-lanceolate, 5.5–17(–22) cm long, 2–6.5(–8) cm wide, rounded to obtusely acuminate at the apex, ± glabrous beneath. Flowers white, 4-merous, small in many-flowered panicles 5–12 cm long. Fruit subglobose, 5–10 mm diameter, densely covered with convex glands. Said to combine the flavour of cinnamon, nutmeg and cloves, allspice is best known as an ingredient in cakes and baking, but is also used in a variety of sweet and savoury dishes and drinks. The first written record of what is probably allspice occurs in an entry for November 1492 in Christopher Columbus's journal of his first voyage. It describes how he showed pepper (Piper nigrum), brought from Spain, to indigenous Cubans and asked if they recognised it. The Cubans indicated that it grew locally. However, they were almost certainly referring to Pimenta dioica because true pepper, Piper nigrum, originates from Asia. Allspice is an evergreen tree almost exclusively grown in the Western Hemisphere, where the species is native and regenerates easily. 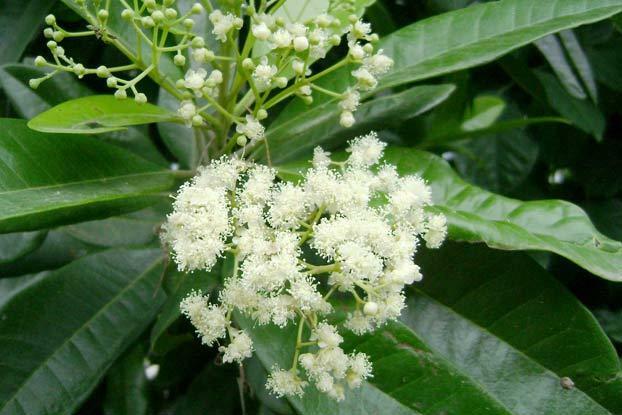 It has also been grown in South-East Asia but with less commercial success. 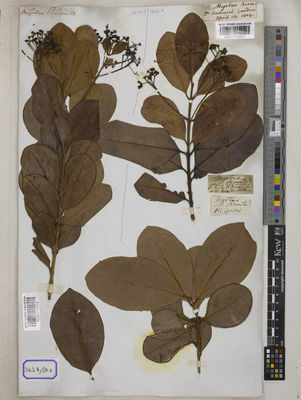 Pressed and dried specimens of Pimenta dioica are held in Kew's Herbarium, where they are available to researchers from around the world, by appointment. 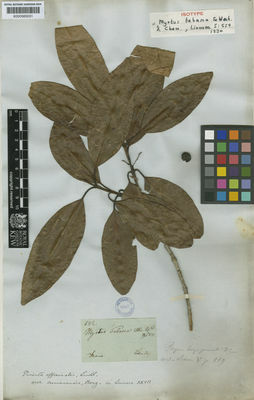 The details of one of these, including an image, can be seen online in the Herbarium Catalogue. Specimens of the fruits, leaves and oil, and several walking sticks made from the wood of Pimenta dioica are held in the Economic Botany Collection in the Sir Joseph Banks Building and are available to researchers by appointment. Sequencing of some standard regions of DNA for Pimenta dioica has taken place as part of the Phylogeny of Tribe Myrteae (Myrtaceae) project currently underway at Kew. 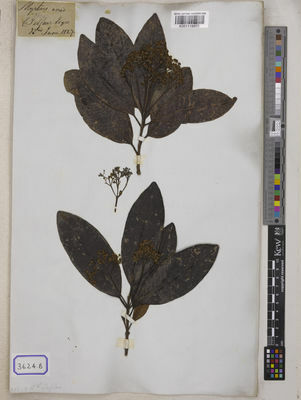 DNA was taken from the allspice plant growing in Kew's Palm House for this study. The project is looking at evolutionary relationships within South American fleshy-fruited Myrtaceae, which are important for studies in the family and in South America and also for a much needed re-classification of the tribe. Hillsides in Central America and the Caribbean. Widely cultivated in its natural range; not threatened. Naturalizada en Colombia; Alt. 40 m.; Islas Caribeñas. Food flavouring and preservative, perfume, traditional medicine. Eugenia pimenta var. longifolia DC. Eugenia pimenta var. ovalifolia DC. World Checklist of Selected Plant Families (2012). Pimenta dioica. Published on the Internet by the Board of Trustees of the Royal Botanic Gardens, Kew. Davidson, A. (2006). The Oxford Companion to Food. Second edition, edited by T. Jaine. Oxford University Press, Oxford. Sulistiarini, D. (1999). Pimenta dioica (L.) Merrill. In: Plant Resources of South-East Asia No. 13. Spices, eds C. C. de Guzman & J. S. Siemonsma, pp. 176-180. Backhuys Publishers, Leiden, the Netherlands. Vaughan, J. G. & Geissler, C. (1997). The New Oxford Book of Food Plants: a Guide to the Fruit, Vegetables, Herbs and Spices of the World. London: Oxford University Press. Bown, D. (1995). The Royal Horticultural Society Encyclopedia of Herbs & their Uses. Dorling Kindersley, London. Landrum, L. R. (1986). Campomanesia, Pimenta, Blepharocalyx, Legrandia, Acca, Myrrhinium, and Luma (Myrtaceae). Flora Neotropica: Monograph 45. New York Botanical Garden Press, New York. Purseglove, J. W. et al. (1981). Spices. Tropical Agriculture Series Volume 1, Longman, London. Dale, Introd. Trees Uganda: 55 (1953). J.P.M. Brenan, Check-lists of the Forest Trees and Shrubs of the British Empire no. 5, part II, Tanganyika Territory p. 378 (1949). R. O. Williams, Useful and Ornamental Plants in Zanzibar and Pemba p. 412 (1949).